13.06.2017 | CAM manufacturer OPEN MIND Technologies AG is presenting hyperCAD®-S Electrode, an innovative module for automating the design and production of electrodes for die-sinking. hyperCAD®-S is an integrated CAD software for hyperMILL®users that is specifically tailored to the requirements of CAM programmers. The most notable addition to Version 2017.2 is a module that provides quick designing of die-sinking electrodes. 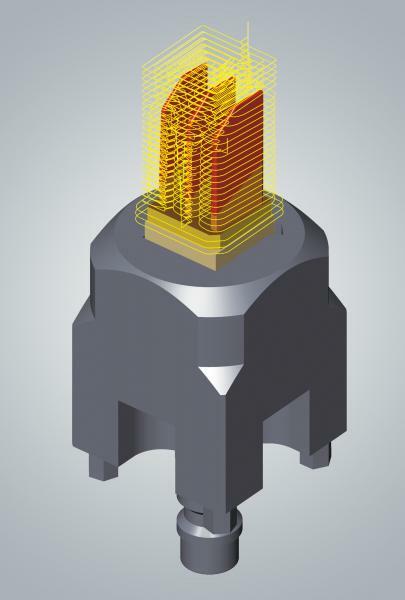 Thanks to the module’s convenient and automated process, users can simply base their electrodes on the face to be die-sunk within the component geometry – no specialist expertise is required. The starting point is given by the faces to be die-sunk within the component geometry. The NC programmer selects these, and the CAD software automatically extends the electrode faces as needed, as well as selecting the blank and holder from a library. The module is suitable for both solid and face models, and the geometry can be selected via faces as well as contours. Any holes in the geometry are filled automatically, and hyperCAD®-S also calculates the minimal rib distance, the blank’s excess and the C angle offset. All the technology data, such as spark gap, blank size, positional reference and colour areas, is automatically transferred to hyperMILL®. The electrodes designed in hyperCAD®-S are then directly transferred to the CAM system for further processing. The user simply selects the electrode in question and commences programming. 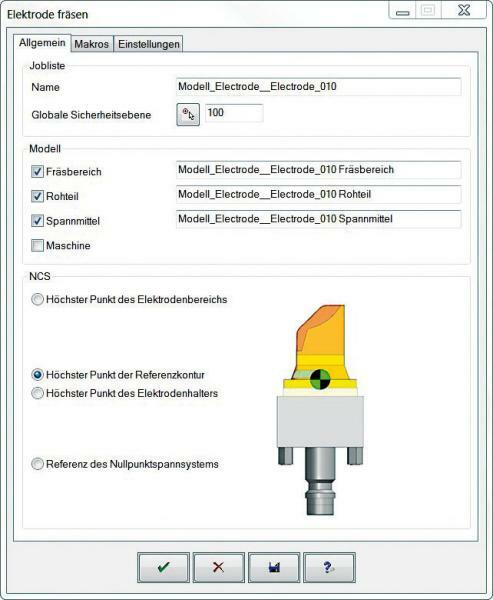 A separate dialog window is available for this, where the milling job for the electrode is specified. Once all the details are entered, hyperMILL® automatically generates a job list containing all the relevant parameters. OPEN MIND develops optimized CAM solutions that include a high number of innovative features not available elsewhere to deliver significantly higher performance in both programming and machining. Strategies such as 2.5D, 3D as well as 5axis milling/mill turning, and machining operations like HSC and HPC are efficiently built into the hyperMILL® CAM system. hyperMILL® provides the maximum possible benefits to customers thanks to its full compatibility with all current CAD solutions and extensive programming automation. OPEN MIND strives to be the best and most innovative CAM/CAD manufacturer in the world, helping it become one of the top five in the CAM/CAD industry according to the NC Market Analysis Report 2016 compiled by CIMdata. 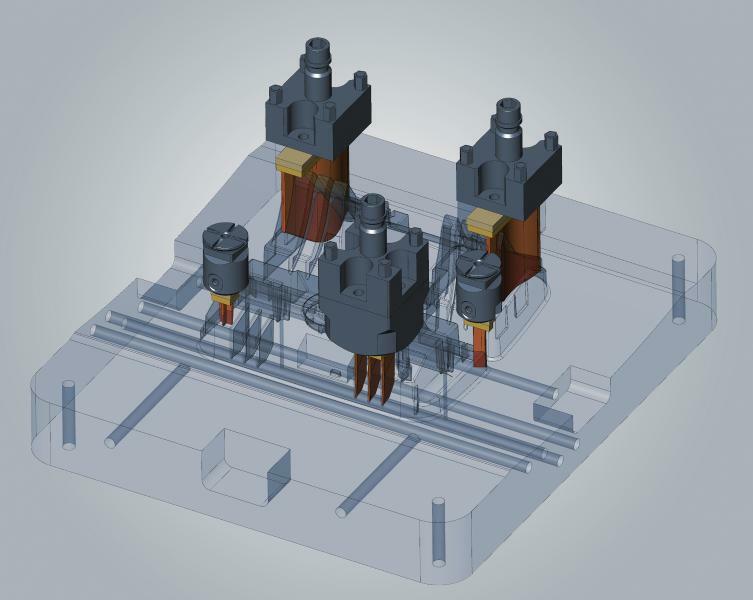 The CAM/CAD solutions of OPEN MIND fulfil the highest demands in the automotive, tool and mould manufacturing, production machining, medical, job shops, energy and aerospace industries. OPEN MIND is represented in all key markets in Asia, Europe and America, and is a Mensch und Maschine company.